We have so much planned for the month of June. The nice weather is finally here and our guests can play outdoors in our shaded playgrounds and freshwater pools. To book your dog or cat’s boarding, daycare, training or spa or grooming visit, call 732.842.4949 (Tinton Falls) or 732.528.8100 (Wall Township). Pool party fun for all our daycare friends born in the month of June. Photos will be posted on Facebook the next day. Starting on Thursday, June 14 we will be honoring all our Dads with a special gift. Looking for something fun and different for your kids to do this summer? Agility For Fun Training Camp will teach the fundamentals of agility to your children and pet. Camp will be held July 16 through July 19. A second week will be August 13 to August 16. The camp is for children between the ages of 9 and 14 and the cost is $150 plus tax per week. Parent or guardian must remain with student during the camp. Please email info@purrnpooch.com or call 732-842-4949 for more information. Wednesday, August 15 ~ 6:00 p.m. – 10:00 p.m.
Join us at the Purr’n Pooch Foundation for Animals 9th Annual Summer Gala. Enjoy a spectacular sunset on the Shrewsbury River while raising money for animals in need. The evening will feature live music, open bar, dinner, dancing, raffles and games. Pamper your pet with a relaxing moisturizing coconut lime verbena shampoo, coconut conditioner, tropical spritz and teeth brushing. This shampoo nourishes the skin and helps reduce shedding while the conditioner will keep skin and coat healthy. $18 plus cost of bath and grooming. Call 732.842.4949 (Tinton Falls) or 732.528.8100 (Wall Township) to schedule an appointment. 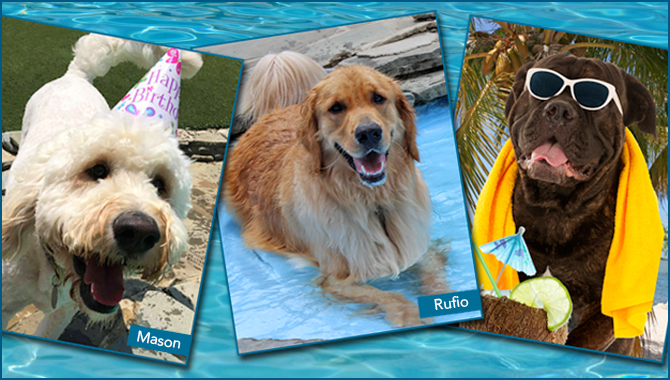 During your pet’s next vacation add a day of outdoor pool time for just $10. To book your dog or cat’s boarding, daycare, training or spa and grooming visit, call 732.842.4949 (Tinton Falls) or 732.528.8100 (Wall).